Michael and I used to frequent an Italian restaurant in Norfolk, VA called Castaldi’s. It was a fun place with delicious food and singing waiters. Yes, you could get a yummy meal while being serenaded with Broadway and big band standards or Italian arias. I mean, doesn’t Italian food taste so much more “Italian” when you’re listening to a live performance of an aria by Puccini or Verdi or a Martin-esque rendition of That’s Amore? The restaurant served a nice antipasto course with fresh baked bread, olive oil, and roasted garlic, and I loved the smell of the roasted garlic permeating the air. That alone was reason enough for us to enjoy many meals at Castaldi’s. But one day we went to visit and it was…gone.The space was covered over with a huge sign announcing the imminent arrival of a California Pizza Kitchen. I felt crushed and we lamented the loss for quite some time. Even now that we’ve moved to Northern VA, we still speak fondly of the whole Castaldi’s experience. Since we can no longer indulge in the warm bread and roasted garlic in the restaurant, I’ve taken to making my own. Roasting your own garlic is very easy and worth every iota of what little effort it requires because the aroma is intoxicating and the flavor smoky and mellow. In just 30 minutes, you will have a delicious appetizer ready to go. Serve with sliced crusty bread and olive oil. Preheat the oven to 500° F/260° C.
Remove the outer papery covering of the garlic, but leave the covering on the individual cloves. Slice off the top of the head so that most of the cloves are exposed. Place on a piece of aluminum foil. Drizzle the oil over the cloves. Fold the foil over the head to completely enclose it. Roast for about 30 minutes, until the garlic is completely soft and lightly browned with some slight caramelization. 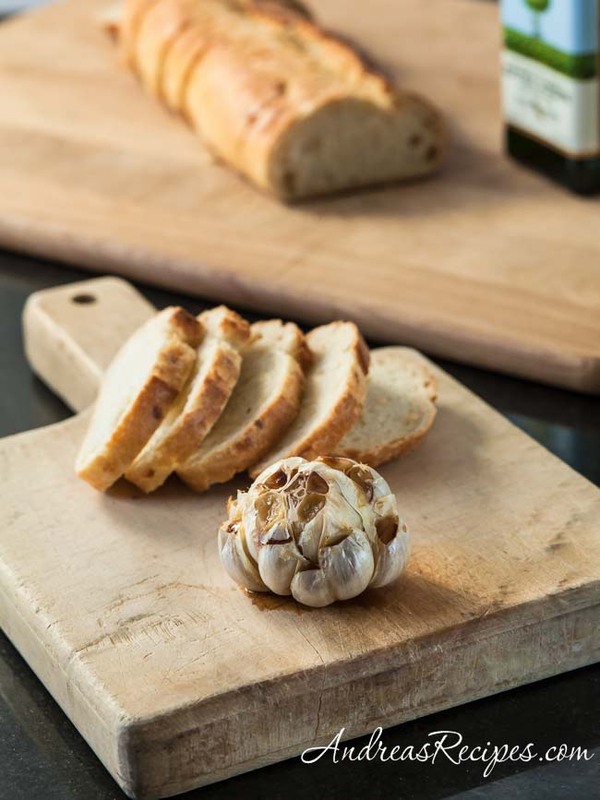 Use a knife to remove the roasted cloves from the head and spread each clove on a slice of bread and drizzle with more extra virgin olive oil. You can also make this in a countertop toaster oven, or even on an outdoor grill. Hi, I have a ceramic garlic roaster that is so cute and I use it in the microwave, but I never take it with me when we visit family, so this is great to know! I was watching a cooking show on our local PBS tv station yesterday. They were making a very simple tomato sauce using roasted garlic. So of course I had to go get the largest head of garlic I could find. I just didn’t know how to roast it. All they did was squeeze the roasted garlic into some olive oil in a pan and whisked it around until it became a paste. Then added some tomato paste to that and worked that until it was all combined. They then just added some of the pasta water and stirred that in. Of course the host loved it, and of course I have to try it. Thanks for the tip on how to roast the garlic. thanks for the tips, we’re roasting it now (at 400 degrees-funky oven) and smells divine. i would have loved that restaurant! reminded me of a place in las vegas at venetian hotel- the guys came around with guitar & violin…i bought the father/son cd. bon appetite!